With a stamp from the FCC on its passport, and some fancy new TV ads, the smell of Microsoft's Surface tablet is thick in the air. Until now, however, price has been a mystery. 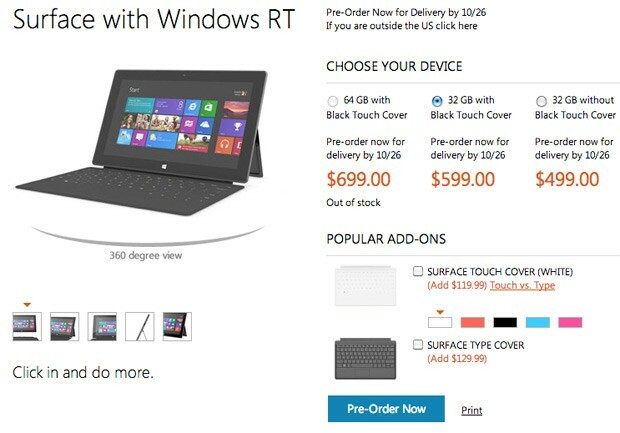 Microsoft has just revealed, via its own store, that if you want a slice for yourself, you can do so starting from $499. That price will get you the 32GB version, without the touch cover, with pre-orders available now, penciled in for a 26th of October delivery date. If you must have that cover, it'll set you back another $100, and the same amount again if you want to hop up to 64GB of memory. With the current status showing as out of stock though, you still might have to wait a little longer. Microsoft puts a price on Surface: starts at $499, or $599 with Touch Cover originally appeared on Engadget on Tue, 16 Oct 2012 08:11:00 EDT. Please see our terms for use of feeds.